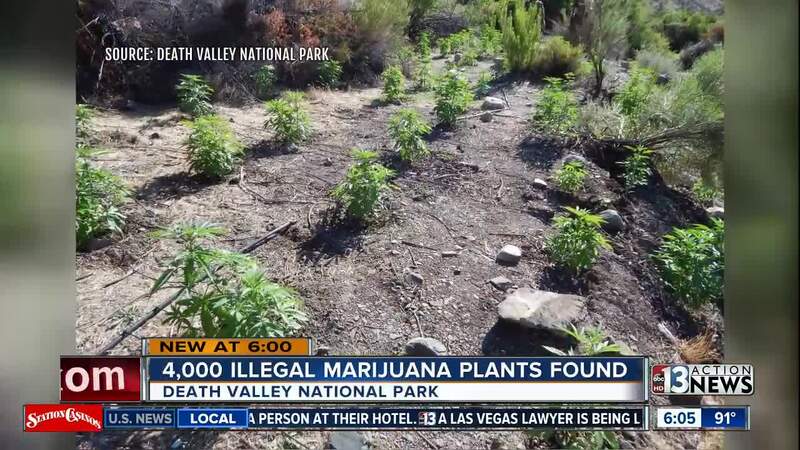 Over 4,000 illegal marijuana plants were found in Death Valley National Park during a raid by the National Park Service on July 3. NPS officials say that hikers encountered three men installing an irrigation hose near a spring in Hanaupah Canyon. The hikers thought that the men worked for NPS, so they asked the men what they were doing. One of the men answered, "Growing marijuana. You won't tell the cops, will you?" Rangers from NPS and the Bureau of Land Management raided the site on July 3. They found four garden plots but no workers. Workers on the illegal grow site cleared away vegetation to make room for crops, and diverted water from nearby springs for the garden plots. Each marijuana plant can use up to six gallons of water per day. Rangers were especially worried about finding carbofuran, which is a pesticide that's highly toxic to humans and wildlife. If you see signs of an illegal grow site such as an irrigation hose, fertilizer, signs of digging, or unusual litter, leave the site immediately and call NPS at 760-786-2330.